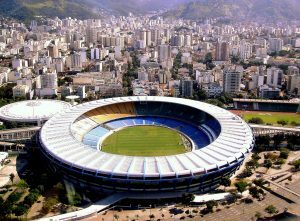 A court injunction mandates that the Odebrecht-lead consortium immediately resume the Maracanã Complex's management, or be subject to a fine of R$200,000 per day. RIO DE JANEIRO, BRAZIL – A preliminary ruling from the Rio de Janeiro State Court of Justice (TJ-RJ) determined that Odebrecht, the concessionaire that leads the Maracanã consortium, “immediately resume” the maintenance and operation of the sporting complex. The stadium has been abandoned, recently falling victim to looting and vandalization. The Maracanã Stadium underwent over R$1 billion worth of renovations required for the 2014 World Cup and the 2016 Olympic Games, but now sits empty, photo courtesy of Wikicommons Creative License. The iconic football (soccer) stadium underwent over R$1 billion worth of renovations required for the 2014 World Cup and the 2016 Olympic Games, but now sits empty, without even electricity, as officials decide who should manage it in the city’s worst economic crisis in modern history. Now an injunction was issued on Friday (January 13th) by Judge Fernanda Louzada, 4th Court of Public Finance of the Court of Justice of the State of Rio de Janeiro. The magistrate took action filed by the State Attorney General’s Office (PGE). The injunction mandates that the consortium immediately retake the Maracanã Complex’s management, operation and maintenance contract. In case of non-compliance with the judicial decision, the concessionaire will be subject to a fine of R$200,000 per day. Local news outlets reported the consortium is comprised of Odebrecht (95 percent) and AEG (five percent). Investigated by the Brazilian Federal Police’s Lava Jato operation, Odebrecht says it has accumulated losses of R$173 million (US$54 million) in the operation. In the decision, the judge stated that “the conduct [of the concessionaire refusing to resume the administration of the sports complex] seems incompatible with the purpose of the concession contract, as already mentioned the principle of continuity of public service and with the clauses of the Term Of Authorization of Use”.